In general, prices have been firm. The average price of condos in the Cayman Islands at the time of our 2012 survey was US$4,242 per sq. m. - just a bit higher than last yearï¿½s US$4,041 per sq. m.. The Cayman Islands is a no tax jurisdiction. There are no income taxes and capital gains taxes in the Cayman Islands. Stamp duties are levied on lease contracts and transfers of properties. Rental Income: Owners leasing properties to tourists are liable pay to tourist accommodation tax a levied at 10% on the gross rent without any deductions. Roundtrip transaction costs are around 13.50% to 20.50% of the property's value. The buyer pays the 7.5% stamp duty. The real estate agent’s commission is around 5% to 10% of the property's value, and is usually paid by the seller. Rent: Rents and rent increases can be freely negotiated. Landlord power is strong. Landlords can (in practice rather than strict law) increase rents in mid-lease, and impose surcharges for late rents. Tenant Eviction: There are no specific legal provisions regarding rental contract termination. Landlords often give tenants notice a few days before contract expiry. Using formal legal channels, it takes an average of 180 days to evict a tenant. 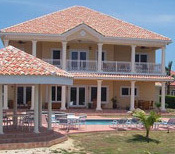 The Cayman Islands is one of the most affluent countries in the Caribbean. Thanks to its twin pillars of development, tourism and international finance, this British overseas territory enjoyed average real GDP growth of 3.1% annually from 1998 to 2007. The country is the world’s sixth largest banking center. “Cayman is a First World country in the Caribbean with a large international business community and well developed, diverse facilities including hospitals, schools, golf courses and hotels,” says Charles Weston-Baker of Savills.